Peanut butter and chocolate? Best combination ever! I love peanut butter and who doesn’t love chocolate. 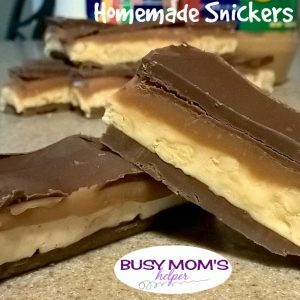 Well if you are like me then these Homemade Snickers are for you. These are simple to make and taste even better than the store bought. This recipe isn’t very hard just mainly waiting for layers to chill in the refrigerator. The recipe makes a whole 9 x 13” pan of delicious, wonderful, and completely your own Homemade Snickers bars. Try freezing them to make a nice frozen treat, and it makes it last longer because you can’t devour it down in one bite. Like white chocolate instead of milk? Just substitute white almond bark and white chocolate chips instead of milk and you can have your own unique Homemade Snickers bar. Line a 9 x 13” pan with aluminum foil so you can easily lift the bars out of the pan when finished. Spray foil with nonstick cooking spray, set aside. In a small microwave-safe bowl, melt together 4 squares of almond bark (1 cup wafers), ¼ cup chocolate chips, and ¼ cup peanut butter in the microwave, stirring until smooth. Spread evenly over the bottom of prepared pan. Refrigerate until chocolate is hard. In a medium saucepan over medium heat, melt butter. Stir in sugar and ¼ cup evaporated milk until dissolved. Bring to a boil and boil for 5 minutes, stirring occasionally. Add in marshmallow crème and ¼ cup peanut butter, stirring until smooth. Remove from heat and stir in chopped peanuts and vanilla until well mixed. Spread evenly over chilled chocolate. Refrigerate until chilled. In a medium saucepan over low heat, heat caramels and remaining ¼ cup evaporated milk until caramels are melted and mixture is smooth, stirring occasionally. Spread evenly over chilled nougat. Refrigerate until chilled. In a small microwave-safe bowl, melt together remaining 4 squares almond bar (1 cup wafers), ¼ cup chocolate chips and ¼ cup peanut butter in the microwave, stirring until smooth. Cool for 5 minutes. Spread evenly over chilled caramel. Refrigerate for an hour. Remove candy from pan by lifting foil then cut into bars. If you want you can melt some additional chocolate and dip sides of the bars in so it’s completely covered with chocolate. First attempt fails! I hate when you think you have an amazing idea and then WHAM! It fails and ends up awful. I attempted these Easy Smore’s with little tiny 2 inch pots and they did not light and ended up not being a fun experience for my awesome family which made me feel terrible. But after a sleepless night over it I tried it again with a 6 inch pot and it was amazing! Perfect Easy Smore’s that I can whip up for my family every night if I wanted without breaking the bank or having a big fire pit in my yard with all the kids being able to make their own personal Smore! So next family get together I’ll be the awesome Aunt/sister who does exciting desserts! Yes this is nothing new, everybody knows how to make smores, over the camp fire, in the microwave, or even on the grill but those are either dangerous for kids, not as good, or not all of us are lucky enough to have a fire pit in our back yard. I love smore’s but in a microwave it is just not the same and kind of boring especially for kids or love seeing the marshmallow burn or melt or just see the fire. 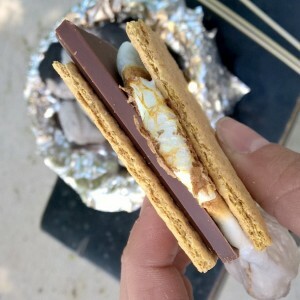 These Easy Smore’s are perfect because they don’t cost a lot, you don’t need a lot of space, and they’re a lot easier to keep your kids from falling into or burning themselves. Make sure you use at least a 6 inch terracotta pot because smaller ones I guess don’t have enough oxygen or what not so they won’t burn. Our failed attempt but they were awesome sports about it! Have fun with s’more toppings – there’s so many more options than just regular chocolate. Chocolate bars, kit kats, reeses, symphony’s, cookies n crème, rolos, kisses, etc. Also you can roast strawberries and air heads, it makes them soft! Start by lining the pot with the tin foil and folding over the sides. Next put about 7 – 8 pieces of charcoal in the pot and pouring lighter fluid over them just so they get wet, now light them. Usually wait about five minutes for the lighter fluid to burn off, sometimes it can cause weird tasting food if you start cooking on it too soon. Put a marshmallow on a skewer and roast it! I love mine totally burnt but golden brown is pretty good too. Have fun with these! There are so many different variations of smores that are so good and keeps them exciting for everyone. Also roasting starbursts or air heads are pretty good as well, it gets them soft and gooey or you can burn them a little if you like. These Easy Smore’s are a fun, quick, and easy summertime activity for any age. Love candy bars? Well make your own then and enjoy cooking your favorites with the simplicity of 2 ingredient Copy-Cat 3 Musketeers! This recipe is incredibly easy and has only two ingredients and still has the smooth and comforting deliciousness. You’ll never buy store bought again! I’ve been experimenting with different homemade candy bar recipes which can be dangerous sometimes like my lovely tootsie roll experience that ended up being a huge mess and didn’t even turn out anything like tootsie rolls (trust me, don’t try them) or like my homemade butterfingers where I end up eating the whole pan in a day. 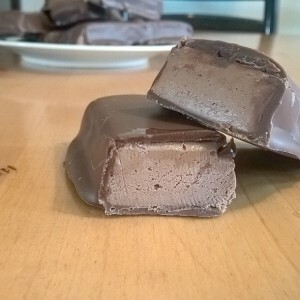 With these Copy-Cat 3 Musketeers I loved how simple it was and I made bite size and froze them and they are so nice to have a little chocolate treat to melt in your mouth whenever I need something small to get me by. 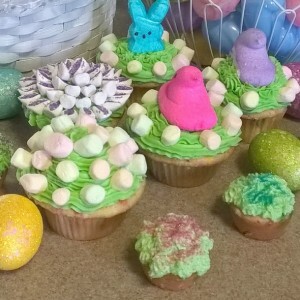 With these, if you don’t have a loaf pan or an 8 x 8 pan make sure you double it or your 3 Musketeers will be mainly chocolate coating and no marshmallow gooeyness in the center. My first batch ended up like this and while they were still good what I really enjoy is the soft marshmallow texture in the center so use either a small pan or double the recipe to get about 3/4 inch thick center. Spray a loaf pan with nonstick cooking spray or line with parchment paper and set aside. In a small microwave-safe bowl, melt 8 oz of the chocolate in 30 second intervals until smooth. Heat the marshmallow crème for 30 seconds in a small microwave-safe bowl. Combine chocolate and marshmallow crème. Evenly spread the marshmallow mixture evenly into the pan and then chill for several hours until firm or place in freezer for 30 minutes. In a microwave-safe bowl melt the remaining almond bark in 30 second intervals until smooth. Cut the marshmallow mixture into bite size pieces or bars then dip into melted almond bark. Tap on the side of the bowl to remove excess chocolate then place on waxed paper until harden. Summer is coming! Let’s get ready by having a basic, quick, and easy cake recipe to whip out for all those fun little parties. 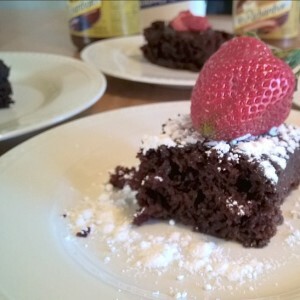 This Crazy Chocolate Cake is quick to make, doesn’t dirty all your bowls and mixers and can be combined with several different fun toppings. I don’t know about most of you but I hate washing dishes, they seem never ending! One of the worst ones for me are big bowls or my mixer, for some reason they seem hard to wash and are always dirty. Well if you’re like me then this recipe will be your friend. This recipe is delicious and easy which makes it really nice when life is crazy (which is pretty much always) and you don’t have several bowls or in fact any bowls/mixers to wash! Crazy right? Well with most of our lives we are already crazy so why not have a good tasting crazy to go with it. Dump the flour, sugar, cocoa powder, salt, and baking soda into a greased 8” by 8” baking pan and whisk together until evenly blended. Make three wells in the flour mixture. Pour vinegar into the first well, pour oil into the second well and vanilla into the last well. Pour water over everything and whisk together well, scraping down the sides and corners well. Evenly spread the batter in the pan and place in the oven for 35 – 40 minutes or until the cake springs back when lightly touched in the center. Cool a few minutes before cutting. Serve warm with ice cream, fresh fruit, chocolate syrup, whipped topping, powdered sugar or whatever fun topping you like with your cake. *For a fun mocha flavor, mix ½ cup cold brewed coffee and ½ cup cold water for the liquid. 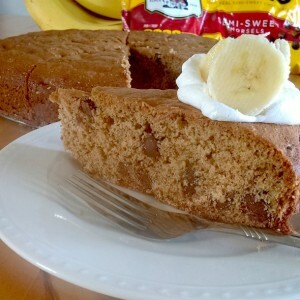 Yes another banana bread type recipe but this is different. This Banana Chocolate Chip Cake is more cake like, has a little bit different flavor and you don’t need mixers, several bowls, and a million measuring spoons. It’s simple, quick, and tastes amazing. With this recipe you should be able to eye ball everything or just use one 1 cup measurer and one 1 tsp. measurer, this way you should only have 4 – 5 dishes to wash; pan, spoon to stir, knife, 1 cup measurer, 1 tsp. measurer. Or if you have to measure everything you can and you can mix this with a hand mixer, but those of you with kids and need something quiet this recipe will be perfect, no loud mixers going. This recipe doesn’t have to be exact on everything, I added more cinnamon and it tasted fine just don’t go overboard on the measurements. Also don’t over-cook the cake, I left mine in a little too long and while it didn’t ruin it it did make it a little dry, pull the cake out when it starts to pull away from the edges. Optional: you can add your favorite nut like walnuts or pecans, about ½ cup if you do but I left them out. Get butter and cut into a few pieces and place in a 9 inch round cake pan then place in the oven to melt the butter. When the butter is melted take it out of the oven and mix in brown sugar and vanilla. Make sure the mixture isn’t too hot, then add in the egg and mix in. Slice banana into the baking pan and add in the cinnamon. Mash the banana into the mixture. Stir in half the flour with all the baking soda and salt until combined then add remaining flour until completely mixed. Scrape down sides and spread batter evenly in pan. Place your cake into the oven for 25 to 30 minutes or until golden brown or passes the toothpick test like a normal cake. You can serve warm or cold, with cool whip, banana slices, chocolate syrup, ice cream, or anything you like bananas with. Do you need a 20 minute weeknight meal that knocks your socks off? 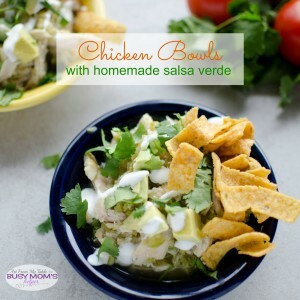 Try these Chicken Bowls with Homemade Salsa Verde! Green Salsa is easier than you think to make. You could make this recipe with jarred sauce, but homemade is SO much better! I don’t think you’ll regret it. Plus, 20 minutes? It’s no time at all for a grand dinner! These are tomatillos. Have you ever tried them? This is what salsa verde, or, green salsa is made out of. They come with these little papery husks on them. Once the husks are peeled off the tomatillos feel sticky. So, next they need to be rinsed well. I like to use a vegetable cloth on mine just to help get it off good. Now that we’ve had a lesson in tomatillos, let’s get rolling on this recipe. This recipe is adapted from Mark Bittman’s Kitchen Express. This is one of my favorite cookbooks for quick meals–as the title suggests. 🙂 It’s all real food and very simple to put together. It’s divided into seasons, and I love that too. If you want to learn how to make anything in your kitchen, Mark also has a book called “How to Cook Everything“. This is my go-to for so many things. Homemade condiments, ice cream, really, anything you can think of, it’s in there–kinda like prego–it’s in there! Quarter the tomatillos and put them in a food processor. Add lime juice, garlic and chiles. Pulse the processor until you have the desired consistency. I like mine a little bit chunky, but not too much. Pour the sauce into a sauce pan and bring it to a soft boil. Add the shredded chicken and let it simmer. Add salt and pepper to taste. Put the sour cream in a bowl, and add just enough milk until it’s a smooth sauce that’s pourable. Load up bowls with the chicken mixture. Top with avocado, cilantro, sour cream sauce and corn chips. Put the sour cream in a bowl, and add just enough milk until it's a smooth sauce that's pourable. Looking for more fast and fabulous meals? Come visit me on my Facebook page for even more awesome recipes! Feeling bored with the same old-same old snacks? 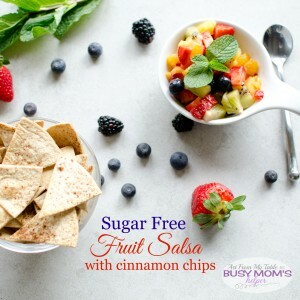 Try this refreshing sugar free fruit salsa! You won’t be disappointed! I don’t know about you, but I try to limit my kids sugar in-take. But often times, they want something sweet. Oh, who am I kidding? I do too! The sugar makes the kids a little crazy sometimes, and it makes my pants too tight. So this is a perfect sweet treat with no sugar. Fruit, it’s good for you! The kids won’t even know ya left the sugar out. 🙂 Try this sugar free fruit salsa for your next afternoon or after school snack. This comes together in just three easy steps. 1. Bake the cinnamon chips. Take flour tortillas and brush them with melted butter and sprinkle them with a little cinnamon. Bake them at 350 for about 12 minutes until they are golden and crisp. Next you’ll chop up the fruit, and put some lemon juice on it. I like the brightness the lemon adds. I used strawberries, kiwi, oranges, mango, blackberries and blueberries. Fruit salsa is really versatile, so use whatever fruit you like. Personally, I think this is fantastic combination. The citrus adds a little something extra. Yum! That fruit looks so juicy and delicious! I just want to lick the screen! Okay, bad idea. Lastly, just put it all together and serve it up. I like to garnish it with some chopped fresh mint leaves. It’s pretty and it tastes fabulous. This isn’t going to last long friends. You’ll also notice that there is no sugar in the Cinnamon tortilla chips. Again, you can do a blend of cinnamon and sugar, but that blend is usually made with two parts sugar and one part cinnamon (that’s a lot of sugar!) so again, in efforts to scale back on the sugar, I left it out. I think the butter and cinnamon is delicious, and the naturally sweet fruit blends it all perfectly. Have I convinced you to try this yet? Brush both sides of the tortillas with the melted butter. Sprinkle both sides of the tortillas with ground cinnamon. Using a pizza cutter, slice the tortillas into eighths. Place the 'chips' on a baking sheet and bake for 12 minutes, or until golden and crisp. Peel, slice and dice all of the fruit and place in a bowl. Add the juice of half of a lemon and stir to combine. Looking for more fun low-sugar snacks? We all know about Mr. Goodbars but what about Mrs. Goodbars? Well Mrs. Goodbars are better, why? Because they’re cheaper, easy to make, are more delicious than Mr. Goodbars, and made by you which always makes them better. Candy bars can run pretty pricy at some stores and sometimes you just need a little (or a lot) of chocolate but there’s nothing in the cupboards and you really don’t want to pull out the mixer, turn on the oven and make tons of dishes. 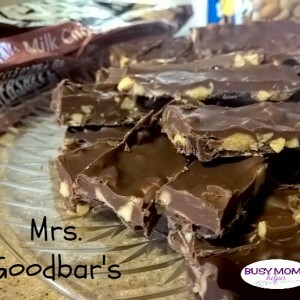 These Mrs. Goodbars are perfect because they’re fast and really easy to make with only a few ingredients. Even better is you can make a big batch, cut them into pieces and freeze, then when you need them pull it out and let it sit for maybe 2 minutes and they’ll be thawed out, instant chocolate treat. Make sure you don’t make them too thick though because that will take longer to set up and thaw out, so if you do double it or triple it keep in mind to put it in a bigger pan so they’re not super thick. In a microwavable bowl melt the milk chocolate chips, dark chocolate chips, and shortening. Stirring every 30 seconds until melted and smooth. Pour into the lined pan and spread evenly. Place in refrigerator until hardened, about 30 minutes. Pull out of fridge and take the chocolate out of pan and place on a cutting board. With a pizza cutter or knife cut into strips, squares, bite size pieces or whatever suits your needs. This recipe is also customizable! Change the chocolate with white chocolate or different nuts like cashews, walnuts, or pecans, make it your amazing treat with nuts and chocolate that are your favorite. Chocolate and peanut butter is possibly the best thing in the world, it is one of my favorite treats and I can eat it all day long. 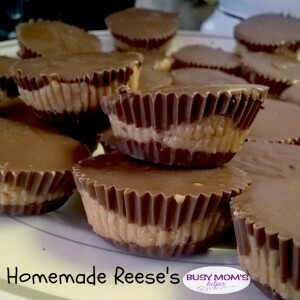 Now I have a pretty easy and cheap way of making my own Homemade Reese’s and enjoying them anytime I want! This recipe is pretty simple; the hardest part is waiting for the chocolate to harden to move on to the next step. The whole recipe took me only about 30 minutes, the 15 minutes freeze time is adjustable, you just want to make sure the chocolate is good and hard or you will have a giant mess when you put the peanut butter in. Also don’t mind my lovely 4th of July liners, they’re all I had and when I made these there was 10 inches of snow on the roads so I wasn’t going and looking for anything nicer at the time but either way they tasted INCREDIBLE! Line either about 10 standard muffin cups or 24 mini muffin cups with paper liners and set aside. I used mini because standard size is huge takes a little longer and not as easy to eat. In a small microwave-safe bowl, heat half of the almond bark in 30 second intervals until it is partially melted stirring between each interval. Add 2/3 cup chocolate chips and heat again 30 seconds until completely melted, add in 1 tablespoon shortening and stir until shortening is melted and the chocolate is smooth. Divide evenly into muffin liners and tap on a level surface to get air bubbles out and have it even along the bottom of the liners. Freeze for about 15 minutes. Mix together peanut butter, butter and powdered sugar until well combined. Spread peanut butter mixture evenly among the muffin liners on top of the hardened chocolate. Melt the remaining almond bark, chocolate chips, and shortening as directed in step 2. Divide chocolate evenly over each peanut butter filled muffin liner and tap on a level surface to get it to cover peanut butter and get any air bubbles out. Bring to room temperature or keep in fridge when ready to eat, enjoy! *can use white almond bark instead. Christmas season is here! I don’t know about any of you but the holidays are my favorite time of year, the decorations, food, giving, receiving, and just the whole feeling of Christmas is amazing. 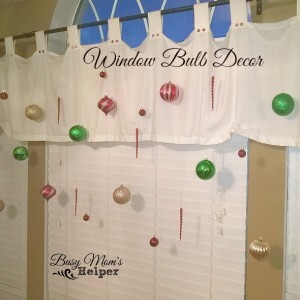 So my house is not very big and does not have a lot of places for decorations but I love tons of decorations so I found this exciting way to dress up my windows for fairly cheap and quick way to add the spirit of Christmas to my house. Holiday Window Décor is easy and it doesn’t take up any needed space. This one takes a little bit of thought because you don’t want to overcrowd one area or have them all one height. I also used three different sizes of bulbs, 15 big bulbs and then I bought a box of 20 that had a really small one and a kind of medium size bulb. If you already have a tension rod or a curtain like I did then skip to step two, if not go ahead and put in your tension rod and to make it look more festive you can wrap garland around it. Start with the big bulbs and hang them different heights and space them out a little bit. Tie a knot to the bulb hook, measure if you like or just guess, then tie it to the tension rod. After the large bulbs are hung move on to the medium and small ones putting them between spaces of the large bulbs tying them the same way. Last add in the icicles in any empty spaces. This window décor is mainly done by sight the key is to making them look good even spaces and filled in enough without overcrowding your window. If you already have a tension rod skip this step, if not then put the tension rod in. I bought a twist one from Walmart. Now it took me a minutes to figure it out but it just twists out and you twist it till slightly bigger than the space then you can push it in slightly to slide it into place. Wrap garland around the tension rod. You can use thick garland, thin, decorated garland or whatever fits your style. Measure and cut the ribbon into strips of about 10 inches long or longer/shorter. Fold one end of the ribbon over your finger then hot glue it together to make a loop for the candy cane. Tie the other end of the ribbon to the tension rod. Place candy canes through the loops. I used 12 candy canes per window and I think it was great if anything I would take out two of them. Customize your windows with different candy canes, ribbon, alternating short then long pieces or however you like, it’s your house make it look amazing to you! I was about 10 years old when I first made homemade bread and I absolutely loved it. Did it take forever? Yes and still kind of does but well worth the wait. 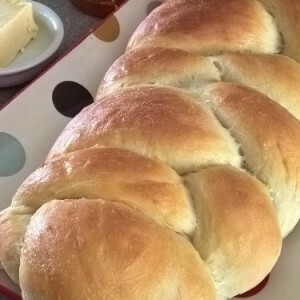 This Braided Bread recipe is simple and the hardest part is waiting for it to rise, the bread looks amazing, smells incredible, and will having people always asking for more. With the holidays and cold weather (at least where I’m at) bread is a great snack to have or serve at any get together with friends and family. This recipe is great for a variety of bread recipes like soup bowls, scones, rolls, bread sticks, sweet rolls, cinnamon rolls, and pizza crust. Take the first four ingredients and mix them together, make sure your milk is warm and not hot, if it is too hot it will kill the yeast. Sprinkle yeast on top of mixture and let sit for a minute. Stir. Add 3 cups flour and stir. Add remaining 3 cups flour and knead until smooth, not sticky. I usually keep mine in the mixer with the bread attachment for this part then knead a little bit more flour after for a few minutes. Place in greased bowl and let rise until double in size (about an hour). Divide into thirds, then divide those thirds into thirds again. Roll each section into a snake, not too thin and even in length. Pinch one side of the ends together and start carefully braiding down pinching the ends together at the end. Place on greased pan and let rise until double in size (about an hour). Bake 375 degrees for 20 minutes or until golden brown. This recipe is also great for scones, bread sticks, sweet rolls, bread bowls, and pizza crust.